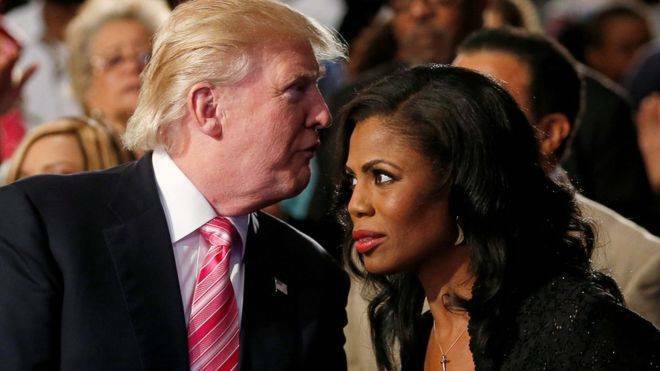 In the tape played on US TV channel NBC, a voice presumed to be Mr Trump's expresses surprise at Omarosa Manigault Newman being fired the previous day. "Nobody even told me about it," the male voice can be heard saying. "Wacky Omarosa" the president calls her. He has a point: her disclosures are hugely entertaining - and embarrassing for the president. Through her book and TV appearances, she's exposed private conversations and the inner workings of an unconventional administration, but she hasn't exposed any serious wrongdoing, and it's unlikely she will. She worked in the office of public liaison, focusing on outreach to the African-American community, and didn't have access to top-level secrets. I'd often see her float in and out of White House events, leaving them early if they got boring, or showing her friends around the place and inviting them to the White House mess for coffee. Her revelations are now creating a stir for a reality-TV-star-studded West Wing but this episode's likely to end soon. What does the 'Trump tape' say? In the excerpt broadcast, the voice said to be the president's tells Ms Manigault Newman he has seen on the news that she is "thinking of leaving" and asks, "What's going on?" "General Kelly came to me and said that you guys wanted me to leave," she replies. "No... Nobody even told me about it," the voice replies. "You know they run a big operation but I didn't know it. I didn't know that. Damn it. I don't love you leaving at all." In a recording she released of her dismissal, the man assumed to be Mr Kelly speaks of "significant integrity issues" as the reason for firing her, mentioning her use of government vehicles. "There are some serious legal issues that have been violated and you're open to some legal action that we hope, we think, we can control," he says at one point. He also says: "If we make this a friendly departure... you can look at your time here in the White House as a year of service to the nation and then you can go on without any type of difficulty in the future relative to your reputation." When Ms Manigault Newman asks if President Trump is aware of what is happening, he brushes the question aside, saying, "Let's not go down the road. This is non-negotiable discussion." Defending publishing the conversations, she said she had "protected" herself "because this is a White House where everybody lies". In the book, she does not say she heard him use the word, or that she heard the tape, but in an interview for NPR radio on Sunday, she said she had actually heard the recording. "I heard the tape," she said.